The ideal home theater system uses speakers embedded in the walls and ceilings to get a full surround soundstage, without cluttering the floors or walls with floor-standing, bookshelf, or wall-mounted speakers. 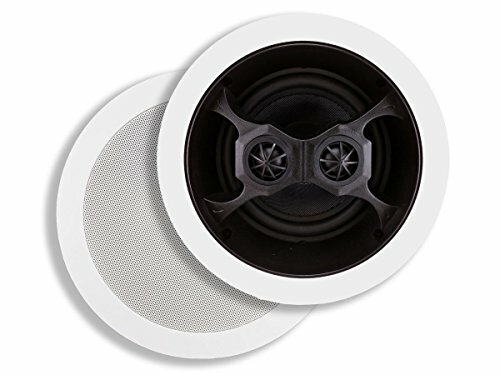 These 6 1/2-Inch Glass Composite 3-Way, Dual Voice Coil, Stereo In-Ceiling Speakers feature a 6 1/2-Inch glass composite woofer cone with 13.3 oz. magnet and rubber surround. High frequencies are handled by two 1-Inch titanium silk membrane dome tweeters. Each tweeter can be pivoted to point at the listening area for a clearer and more accurate high-end response. What really sets these speakers apart is that they have two sets of speaker wire inputs on each speaker. If connected to different channels, each speaker can produce a stereo effect by itself, making these speakers well suited for dispersed listening, where normal stereo separation is impractical, such as in a noisy club. The speakers can also be wired as normal mono speakers, in which case the dual tweeters can be angled to provide a larger -Inch sweet-Inch spot. These 8-ohm speakers are rated for 40 watts of continuous power and 100 watts maximum. They boast a frequency response range of 57 Hz to 20 KHz and an 85 +/- 2dB sensitivity. The speakers fit into a circular 8.07-Inch diameter cutout. While these speakers are marketed as -Inch in ceiling-Inch speakers, they can be used vertically in a wall as well. The only difference between -Inch in wall-Inch and -Inch in ceiling-Inch speakers is the shape. Convention has square objects on a wall (e.g., pictures, windows, etc.) and round objects on the ceiling (e.g., light fixtures), but you are free to design your home theater sound system any way you want, with round speakers in the walls and/or rectangular ones in the ceiling, if that is your preference.